There is a new building in Gent that stands out among the rest, perhaps as obviously as I feel I stand out as an American in a crowd of Gentenaars! Sitting in the shadows of the famous stone Gothic towers, its glass and dark metal shines within the city’s skyline of gray slate and red-orange clay roof tiles. A perfect example of “one of these things is not like the other,” the sleek, modern architecture of this new building, De Krook, represents what is fresh, new, and forward-thinking in Gent. Inside, De Krook Bibliotheek offers many resources, services, and activities for all residents of Gent, young and old, native and foreign. With it all taking place in the modern and technologically advanced setting of De Krook, a space for the joining of knowledge, culture, history, and innovation is created. Its modern form, atypical to Gent but still warmly embraced by the city, reminds us that we are all welcome in Gent and can contribute to the city’s knowledge and culture, regardless of our own design. De Krook shines at night. De Krook opened in March 2017. Its name refers to its location on a curve of the Scheldt River. 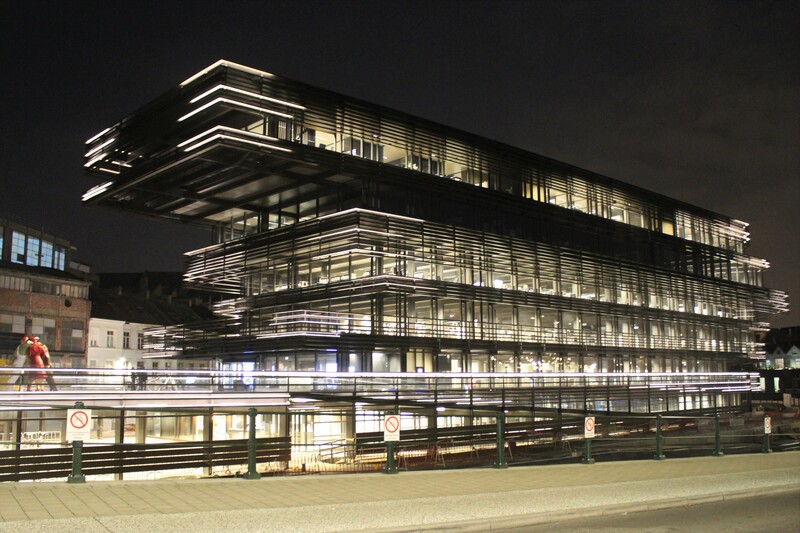 It is home to the city’s library (De Krook Bibliotheek), to some departments of the University of Gent, organizations like Urgent.fm radio studios, and to imec, an innovation hub for nanoelectronics and digital technology. De Passanten by Michael Borremans. This mix of occupants creates a unique space in the middle of Gent where knowledge, information, innovation, technology, researchers, and the public can collide. As you approach the main entrance of De Krook, a sculpture, De Passanten by Michael Borremans, visually represents this idea. 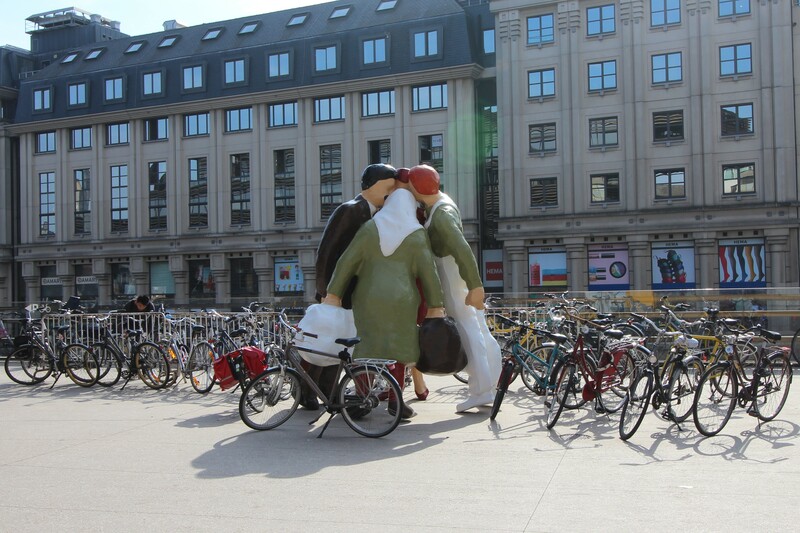 It depicts four people putting their heads together, symbolizing the blending of knowledge and culture that De Krook visitors will experience when utilizing its many resources, services, and public activities. Thanks to these concepts and its 21st century design, De Krook won a Real Estate Society award (the self-proclaimed “Real Estate Oscars”) for “Best Public Project of 2018”. The largest and most obvious occupant of De Krook is De Krook Bibliotheek, the main branch of the City of Gent’s public library network. It offers all the traditional services you would expect from a public library, and much more. 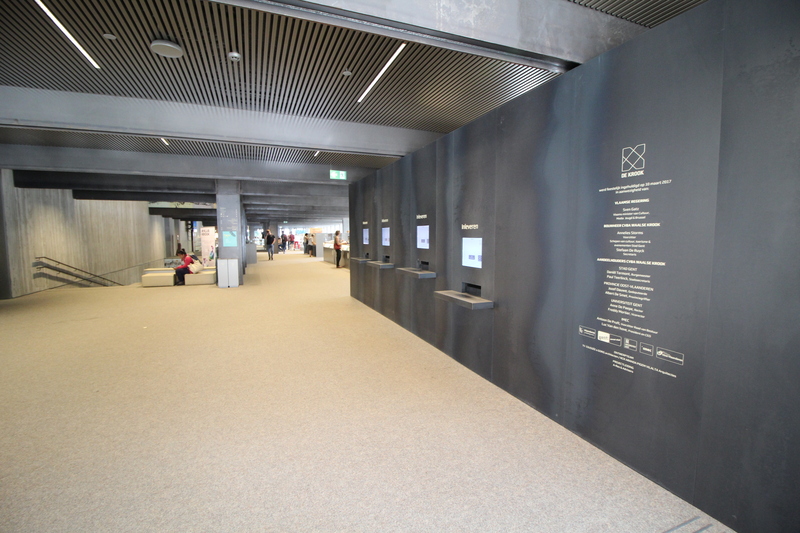 Digital screens guide visitors through De Krook Bibliotheek. The Library prides itself on its accessibility and technology. 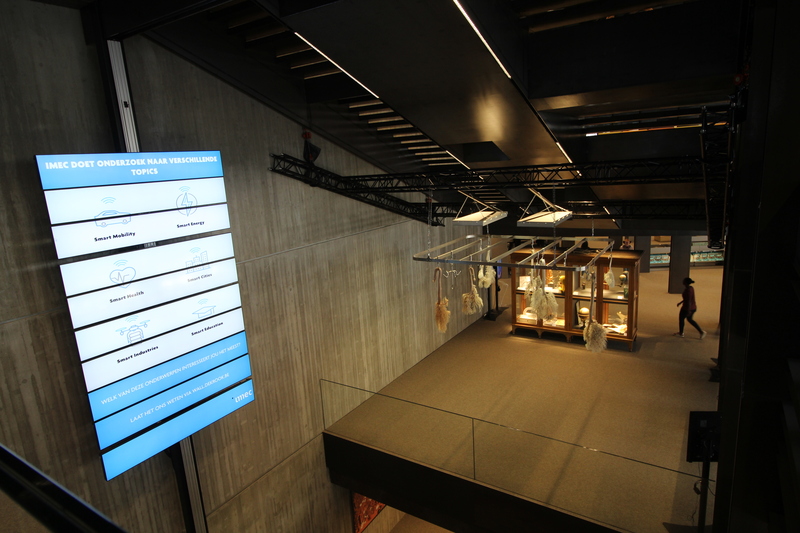 It has many (72, to be exact) information screens to guide visitors throughout the building. The library’s online portal contains its catalog, digital apps, digital newspaper and magazine subscriptions, and other services. There, you can customize your own “My Library Gent” account to renew your reservations, pay fees, create and maintain reading lists, request books, access media archives, and receive customized reading tips. Similar services are available from De Krook Bib App for smartphones. Thanks to the modern design of De Krook and the Library’s use of technology, BBC named De Krook one of the ten most beautiful modern libraries in the world. Many services are available at De Krook Bibliotheek’s entrance. Anyone can register for a library membership card for free with a valid proof of identity. Children under 12 years must have a parent with them to register. You can register at any of the local libraries for membership to Gent’s entire public library network. There is no expiration to the registration. The only exception to these procedures is that lost or stolen library cards will be blocked and there is a €10 replacement charge, €5 for children. Borrowers can use their library cards to borrow from any of the library branches in and around Gent. Borrowed materials can be returned to any of the library branches as well, regardless of which branch it was borrowed from. There are some standard rules (explained online here) that apply to borrowing, including reasonable limits to how many materials you can borrow at one time and for how long, and fees for lost or stolen materials. Library members can reserve and borrow from its entire collection of books, music, movies, comic strips, games, magazines, newspapers, and other offerings. You can search the entire catalog online at this link, and can learn more about what the collection includes at this link. 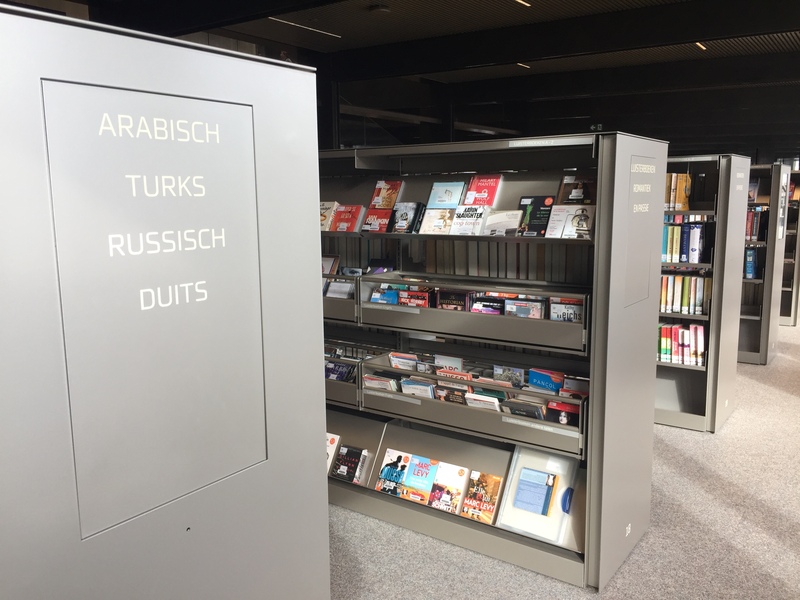 The collection of books in other languages in De Krook Bibliotheek. There are some catalog features that might be of particular interest to expats in Gent. For example, library members can borrow English e-books through the online “My Library” service. These can be read using a tablet, PC, or e-reader, though not all are compatible, so check the Library’s website here for details. You can borrow up to 3 e-books at a time for 3 weeks at a time. The in-house collection of books includes a decent sized section of books in English and other languages. The collection also includes many language-learning resources in the form of books, CDs, DVDs, and CD-ROMs. This includes NT2 language courses and materials which teach Dutch to non-native speakers. You can take guided tours of the library with different focuses. These range from basic tours, to family-friendly interactive searches, to architectural focuses, and more. All the tours are offered in Dutch, and some are offered in English, German, or French. Costs for these tours vary based on the tour. Free tours are available on Saturdays by library staff (registration is required). Find more information about all the tours on the library’s website. If you’d rather take a self-guided tour of the library, a brochure of its floor plan is available here at this link. There are plenty of signs and labels throughout the building to help you get around as well. There are many rooms in the Library available to rent for private study, presentations, and meetings. More information on requesting and reserving these spaces is available here on De Krook website. De Krookcafé (find them on Facebook and Instagram) offers a nice space with a beautiful view for drinks and light dining. It maintains the same opening hours as the rest of the Library. If, while you are walking around the Library, you hear a strange, consistent tapping sound, you might be hearing someone playing the keys of De Krook’s electric piano with headphones. This piano is available for visitors to play for one hour at a time on a first-come, first served basis (no reservations). It must be played with its own headphones which can be borrowed from the first floor information desk. 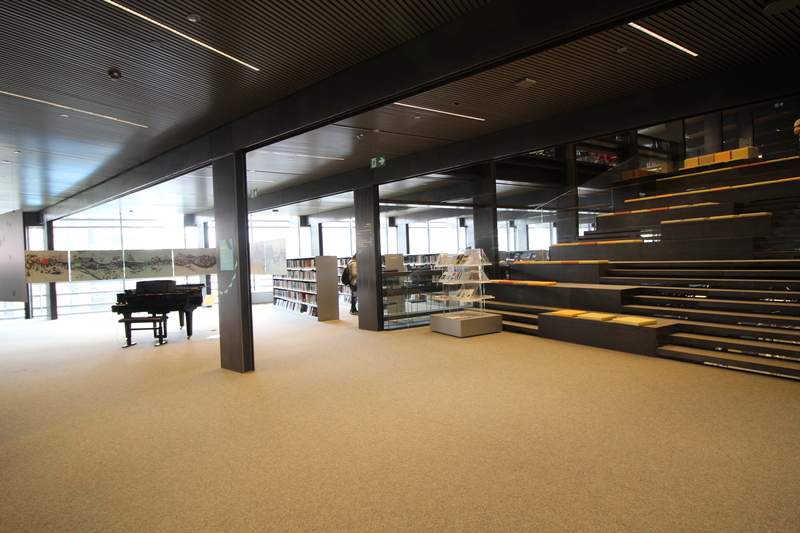 The electric piano in De Krook Bibliotheek. For library users with their own laptops and mobile devices, free wifi is available. Other members can use the library’s computers for free by booking reservations at the library entrance with their membership card. You must start using the computer within seven minutes of booking or your reservation will expire. There is a limit to two people per computer, and a maximum of two hours per day and 12 hours per week (one hour per day and 6 hours per week for children). The computers have the standard Microsoft Office suite of programs (Word, PowerPoint, Excel). They are also equipped with headphones and e-card readers, which are handy for any administrative work or taxes! Library users can print (black and white) from the Library computers at a cost of €0.25 per A4 page. Devices are also available for scanning (free) and copying (€0.25 per black & white A4 page and €0.75 per color A4 page). The Library’s Digipunt offers free internet and computer technology support for users on Library PCs or their own laptops, tablets, or smartphones. Check the website for the hours this service is available. Other advice points are available at the Library including: Het Centrum voor Leerlingenbegeleiding (CLB), a center for educational guidance; De Stap, offering advice on training and education; De Wetswinkel in De Krook, providing legal advice; and digital homework and study guidance for children and youth. De Krook Library is a popular location for students to study. (Have you ever seen a crowd form while waiting for a library to open? Because I have, at De Krook, and they were mostly students!) It offers 325 workstations specifically for students and adult learners to use for studying. Other spaces in the library are marked as forbidden for work and study. They are to be kept available for library visitors making use of the library catalog and other services. A map of permitted study spaces is online here, and they are well marked in the library. There is an entire floor of the Library devoted to children up to age 12. Baby-changing and breastfeeding facilities are available. Another floor is devoted to youth from 12 to 18 years old. The floor for young adults (-2) is a cool place for youth to hang out and enjoy a variety of books, music, DVDs, and use other available technology. The English e-books collection available for borrowing (mentioned above) includes titles in the Young Adults genre. Children’s and Youth activities and events include storytelling times, curiosity workshops, digital workshops, reading advice, study support, #KLUBKROOK activities for teens, and opportunities to serve as children’s and youth jury members in Flanders. De Krook offers regular events and activities for all ages including seminars, lectures, workshops, art exhibits, debates, and presentations. Registration is usually required. The main activities calendar can be found online here. Printed copies of the activities calendar are available in the library, and pdf versions of those are also online here. If you don’t feel like looking up events on your own, you can subscribe to a monthly e-newsletter through this link. The Library hosts an annual book sale, usually in June, where discarded books and CDs are sold. Proceeds go to charity. Detailed information about the book sale can be found at this link. There are also opportunities to volunteer in the library. These likely require the ability to speak Dutch. You can find out more about those opportunities on the website here. A welcoming terrace with beautiful views wraps around De Krook. Getting there: De Krook is located next to the Zuid Shopping Center in a car free zone. Arrival by foot, bicycle, or public transit is recommended. All the major public transport options (buses, trams, taxis) reach this area. Car parking is recommended in the city parking garages. Find more details on all these ways to get to De Krook at this link. Bib Aan Huis: For members with mobility issues or situations preventing them from visiting the library in person, there is Bib Aan Huis (Library at Home). This service arranges for a volunteer to bring reserved and borrowed materials to the member’s home. It also arranges the returns. More information on this service is available on the Library’s Bib Aan Huis website. Have you been to De Krook Bibliotheek? Is there anything else expats in Gent should know? Share your thoughts in the comments! *All photos for this article by Rebecca Bramlett.